We’re back in Purcellville, VA in the gorgeous auditorium at Franklin Park Arts Center. This venue has reserved seating, so pick out your seats today! We’re playing a double bill with Andy Hawk’s band the Train Wreck Endings. Should be a complete blast. Please help us spread the word. This is going to be a damn fun experiment! Rock on Loudoun County. 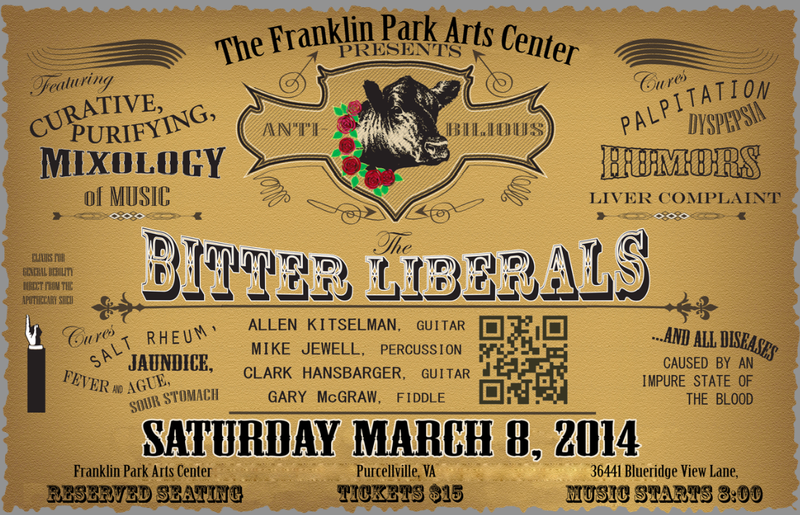 This entry was posted in band, bitter liberals, gig, original music, poster and tagged Allen Kitselman, Andy Hawk, bitter liberals, Clark Hansbarger, concert, conga, entertainment, fiddle, franklin park, Franklin Park Arts Center, gary mcgraw, guitar, mike jewell, music, new songs, Purcellville, VA TICKETS. Bookmark the permalink.